Rajinder Gupta was born on April 4th 1989 in Jammu, India. In 2007 he started his Bachelor in Biotechnology from Dr. DY Patil University Pune, India. For his thesis he worked at IIIM Jammu, India on animal models to check for toxicity of novel plant extracts. he got selected as a quality analyst at Cadilla Pharmaceuticals in July 2011 but after working for a few months he was convinced to go for higher studies. 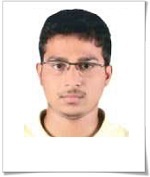 He joined Jaypee University of Information technology Solan, India for his Masters in Computational Biology in 2012. He topped the class and was awarded Gold medal by the Vice-Chancellor. At the Master's degree he developed his skills in the field of Computational Biology with good command in Perl, network motifs and databases. He worked at NABI (National Agri-Food Biotechnology Institute), Mohali, India September 2014 - April 2016 and worked as a Junior Research Fellow in Computational Biology Deparment. His broad work line included Pathway analysis for various plant models, Pathway augmentation through sequence homology searching and automated literature mining. In May 2016 he joined as a PhD student the Department of Toxicogenomics, Masstricht University where he is working on the EU-ToxRisk project.